Hi everyone! TGIF! We are heading to a birthday party tonight for our sweet nephew who just turned two. Tomorrow, my parents are having a family cookout, so that should be fun! Hopefully we will have nice weather. What are you all planning to do this weekend? 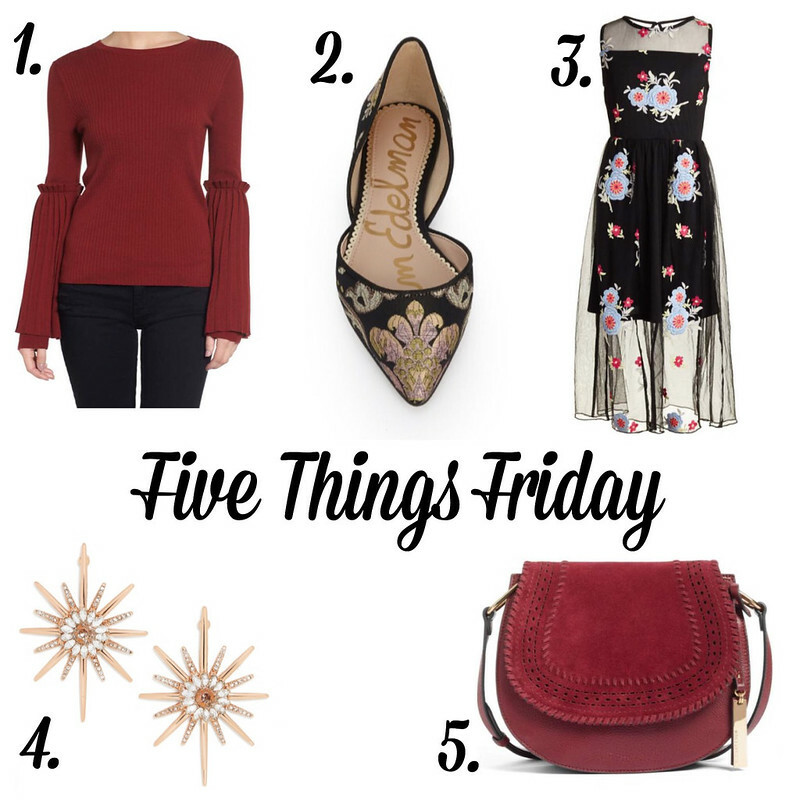 My picks for the week are a bit dressier than usual, but I am loving all of the florals and embroidery going on right now! This red bell sleeve top is so fun and pretty. The red color is supposed to be huge this coming season. I have been swooning over shoes and booties with embroidery on them. I think this black floral embroidered dress is just gorgeous! As soon as I saw it, I fell in love. It is sold out in my size, but if I find something similar I will buy it. The earrings are by Baublebar, one of my favorites and they are under $35. Lastly, I am loving this saddle crossbody bag but it is a bit pricey. This one was included in the Nordstrom sale earlier this year and might go on sale again. Thanks for stopping in today. Enjoy your weekend!